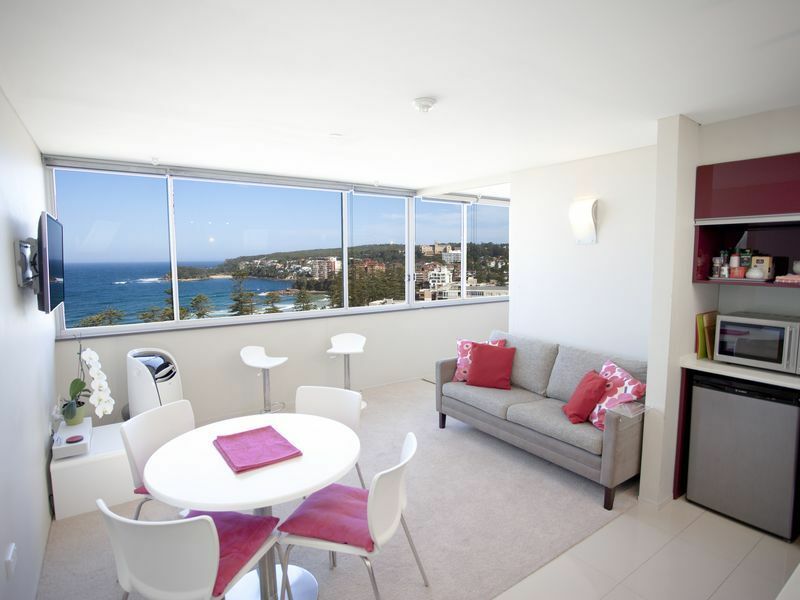 Manly Beach Apartment + Views! * 1 x Lounge room/dining area fully furnished, including entertainment system. * 1 x Full kitchen with granite benches, quality appliances, cooking utensils, and tableware for 4 people. * 1 x Bathroom with shower and bath. * Air conditioning, Dishwasher, Convection Microwave Oven, Fridge, Vacuum Cleaner. * Modest sized, roof-top communal pool. * Linens and towels provided. * Management available 24 hours. * Building has own coin operated laundry facilities. * Building has 2 lifts for apartments, no stairs required to get to apartment. Had a great stay. Fabulous location for beach, cafes, pubs & Manly wharf. The apartment was very well presented, on the small side but perfect for a couple. The apartment was very well equipped. It had everything you could wish for as in coffee, tea, milk, towels etc. Home away from home. Our host was excellent, very informative & went through everything within the apartment. We stayed 4 nights........wasn't long enough, wished we could have stayed longer. This is a well maintained property with beautiful views of the beach and a stone throw away from the shops and restaurants. The host was professional and courteous showing us around the apartment and had a genuine interest in ensuring that everything possible was done to ensure we had an enjoyable stay. We are looking forward to coming back. From the minute we chose to book this apartment. Everything was smooth and convenient. Great Communication throughout. The apartment provides you with everything that is required in a great location with wonderful views. The car parking space that is included in the building is really convenient too. We had a Great stay and will definitely return and recommend this apartment to our friends & family. Superb location, what a view!! Fantastic location, lovely host and excellent facilities. The view was superb. The dining options superb.